The Ministry of Environment and Tourism (MET) on Wednesday, 24 October 2018 inaugurated its first-ever Nature Conservation Board to represent the wildlife sector and foster an operational partnership. 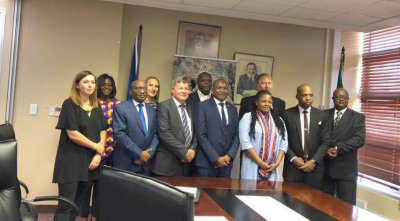 Inaugurating the board of 11 members, Minister Pohamba Shifeta said it creates opportunities for the minister and the relevant organisations to engage the sector on the policy framework, solutions and strategies for transformation. He said the board should advise the ministry on economic growth, conservation, sustainable use of wildlife resources and other wildlife matters. Former MET Permanent Secretary, Dr Malan Lindeque was installed as the Board’s Chairperson and he is joined by Dr Caroline !Garus-Oas as Deputy Chairperson. The other members are Benedict Libanda, Patricia Skyer, Danene van der Westhuizen, Uda Nakamhela, Elzanne Erasmus and Drs Michael Humavindu, Selma Mekondjo Wardine Lendelvo, Solomon Amadhila and Chris Brown. Shifeta explained that the challenges of nature conservation are many and this prompted the ministry to establish this board. These challenges include land degradation, climate change, poaching and human wildlife conflict. The functions of the board will include advising the minister in relation to the control, management and maintenance of national parks, game parks and nature reserves, as well as the establishment and management of conservancies. Their duties also include investigating and reporting on all matters relating to nature conservation referred to the board by the minister and to fulfil other tasks which fall within the objects of the Nature Conservation Ordinance, 1975 (4 of 1975) and are entrusted to the board by the minister, Shifeta added. Nature conservation not only requires the employees of MET to manage the institution, but will require different minds, inputs, solutions and strategies to engage the sector on policy framework, he explained. of Environment on how we can deal with such challenges, opportunities and benefits.